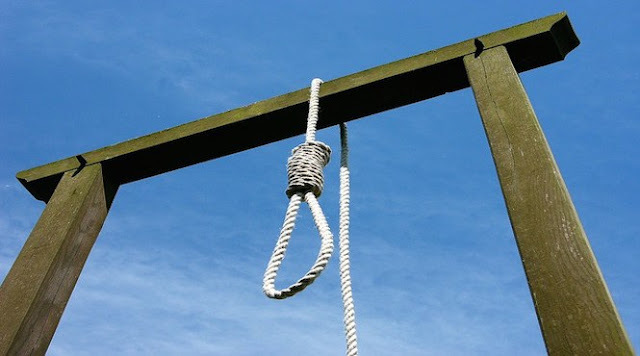 A 21-year-old man, Abdulateef Babatunde, is to die by hanging for robbing two men including a policeman of their motorcycles at gunpoint. Justice Dele Omotoso of an Ekiti State High Court sitting in Ado-Ekiti on Tuesday found Mr Babatunde guilty of the two count charge of armed robbery preferred against him. According to the charge sheet, Mr Babatunde on or about June 16, 2016 along NTA Road, Ado-Ekiti, robbed one Kayode Babatimilehin, a police sergeant, of his Bajaj motorcycle with registration number GED 550 QA. Mr Babatunde also robbed one Sheidu Ganiyu of his Bajaj motorcycle with registration number ADK 193 QH, in similar circumstance the same day. The convict, while committing the robbery, was armed with offensive weapons including a gun. Mr Babatunde allegedly stopped Mr Babatimilehin and asked for his ticket but the policeman told the convict that he was not a commercial motorcycle operator. The policeman said the convict brought out a locally-made pistol pointed it at him and dispossessed him of the bike. He said the convict was later arrested after being given a hot chase by some bike riders and was taken to Okesa Police Station. Mr Ganiyu, in his evidence, told the court that he gave the convict a ride on his motorcycle from Egbewa area heading to Abuja Quarters in Ado Ekiti but the convict asked that he be dropped in a lonely place. Mr Ganiyu explained that he later heard that the convict had been arrested and the motorcycle recovered from him. The prosecution called six witnesses and tendered exhibits including the stolen motorcycle, statement of the convict and one locally made pistol while defence did not call any witness.